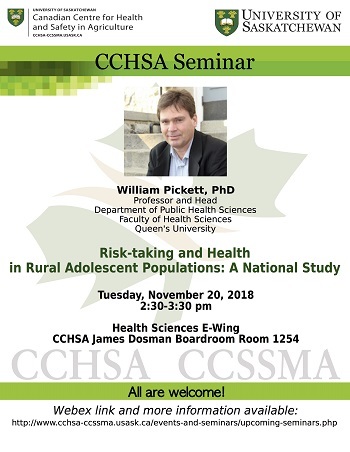 The Canadian Centre for Health and Safety in Agriculture (CCHSA) will be hosting the weekly seminar on Tuesday November 20. The seminar presenter will be Dr. Willian Pickett. Title: Risk-taking and Health in Rural Adolescent Populations: A National Study. Seminar will be held from 2:30-3:30 pm in the James Dosman Boardroom (Health Sciences E-wing 1254).